it is a paradox of sorts. Even as the Orissa farmers reel under recurring spells of droughts and floods, the state government has decided to raise the water tax for irrigation. The raised tax, to be imposed from the next kharif season, is substantial. The farmers will now have to pay Rs 250 per hectare (ha) instead of Rs 100 in the kharif season and Rs 450 per ha instead of Rs 225 in the rabi season. Interestingly, the recent hike means a five-fold increase in water tax in just five years. In fact, in 1996, the then Congress government had increased the basic water rate of paddy for kharif from Rs 40 to Rs 100 per ha and for rabi from Rs 90 to Rs 225 per ha. Although the move has been criticised widely, the state government justifies it by saying that the increased water tax would increase its revenue to Rs 36 crore from the present Rs 20 crore. However, Lingaraj of Bargah-based organisation, Samata Bhawan, says: "Water tax worth Rs 79 crore is pending with the industries. Why is there no effort to recover this?" He alleges that "the industrialists' lobby has a say in government decisions but the farmers' voice remains unheard". Echoing Lingaraj, Jagdish Pradhan of Sahabhagi Vikash Abhiyan, a Bhubaneswar-based non-governmental organisation, says: "The government and industrialists are hand in glove and exploit the farmers as they are not organised." "We are increasing water cess to generate revenue for the economic development of the state." This is another reason given by the government to support its decision. "The hike effected in water cess was inevitable, as any deviation from the government's agreement with the World Bank signed on January 5, 1996, would have deprived the state of financial assistance of almost Rs 4,000 crore," reveals a government spokesperson. Getting aid for economic revival is okay. But why put the farmer's life at stake? Gourachandra Khamari, president, Orissa Rajya Krushak Sangathan (Orissa State Farmers Association), says, "In recent times, the increased cost of production coupled with the distress sale or even absence of it has affected the farmers adversely. 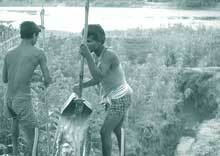 The exodus from Orissa villages is underway." Pradhan says," It is now a regular feature for people having even six ha of land to migrate in search of daily wage employment outside. They either prefer to lend their land for share cropping or simply leave it fallow. One of the major impacts of this tax hike will, therefore, be increased rural unemployment." As if the hiked water tax was not enough, the state government is adding insult to injury. It now intends to entrust the farmers with irrigation management. "A farmer will have to dish out at least Rs 2,500 per ha of land if the management of the irrigation system is vested with the farmers," says Lingaraj. A farmer from Ghanapali village near Hirakud command area, Krushna Chandra Pati, says, "The tailend farmers suffer because they pay the tax but are unable to reap the benefits. With the enhanced tax and irrigation management cost, these farmers will have no other option but to commit mass suicide." The government feels otherwise. It says that the farmers would not face any crisis because of the hiked water cess or irrigation management charge. Pradhan cites the example of Punjab where farmers enjoy subsidies in 'electricity for irrigation' and 'other agricultural implements and requirements'. Considering this, the Orissa farmers are really at the receiving end of the government's decision. They are earnestly hoping that the state government would roll back the hike. If it doesn't, they may launch a struggle for their survival.